When I tell people that I love a band called The Naked and Famous it seems to spark a sense of curiosity—possibly because of their name. For me, it ignites a specific kind of nostalgia, placing me right back in my first year of high school–filled with angst and anxiety. Lead vocalist Alisa Xayalith and guitarist-vocalist Thom Powers have a special way of writing some of the most transcendent synth-pop tracks I’ve ever heard; something that always keeps me wanting more. Luckily, I got the chance to see the Auckland-based group in NYC, and it was a magical experience that I will never forget. Walking into the Hammerstein Ballroom for the first time, my emotions were as high as the hand-painted ceilings and balconies. The first set of the night came from The Chain Gang of 1974, who had everyone dancing to catchy powerful pop tracks, including their most popular song, “Sleepwalking”. Singer Kamtin Mohager and the backing band also performed “I Still Wonder”, the solid lead single from their upcoming, yet to be named, album that was produced by Powers of the night's headlining band. Sibling collaborators Paige and Chase Duddy and their band XYLØ were next to take to the stage. With Paige’s powerful vocals shining through, the group made a solid impression on the crowd. 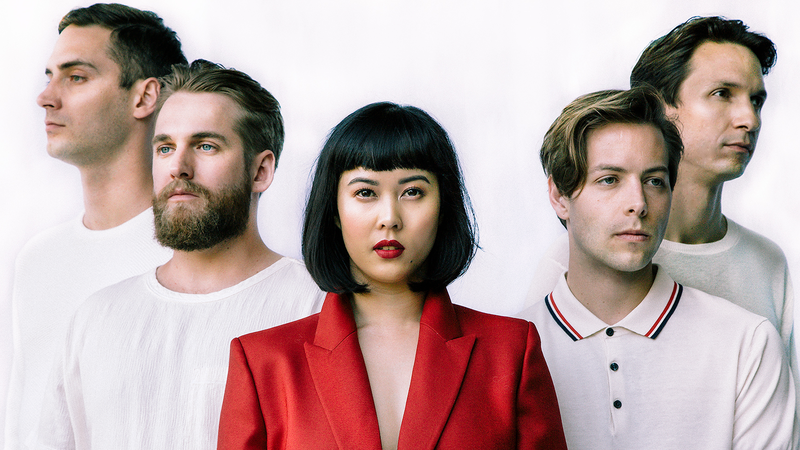 The highlights from their set included “America”, a haunting song from their latest EP, and a performance of their latest track with The Chainsmokers, called “Setting Fires”. After their set, the crowd was ready. As the lights went out, the foggy air was hit with a colorful array of beams of light. The New Zealanders graced the stage as they built up the intro to “The Water Beneath You”, the second track off their latest release, Simple Forms. Xayalith and Powers took turns weaving in out of duets and harmonies, their voices soaring over synth waves and hard-hitting drums. As the screams from the audience members subsided, the set moved into some old favorites from their first album Passive Me, Aggressive You, pop anthems like “All of This” and “Punching In A Dream”. As the night continued, I couldn’t help but feel ecstatic about seeing a band that has evolved musically, while keeping their core integrity in tact—something that caught the attention of so many supporters years ago. New tracks, “Higher”, “The Runners” and “Laid Low” were a perfect mix of live instrumentation and infectious synthetic bliss. Slowing it down a bit, TNAF performed an alternate version of “No Way”, which was accompanied by soft blinking lights, setting the tone for one of the standout songs of the night. Picking things up again and rounding off the evening, The Naked and Famous blessed us all with “Girls Like You” and “Young Blood”, back to back. Hearing the latter track was such a special moment because for many, it’s the song that first got them hooked on this incredible group of musicians. As the final song was played, I threw my arms in the air and screamed at the top of my lungs, and just like that, the night was over.